A knitter who was looking for the pattern for my Aran Wrap, which originally appeared in the Vogue Knitting Fall 2008 issue, just emailed me to let me know that the pattern is now available for purchase in the Vogue Knitting online pattern store (as a pdf download). Thanks Heidi! At the moment the pattern is on sale, too! When we designed a new office for my husband, we included a space for a stained glass window. It's an interior window, between the office proper and the stairwell. I have always loved stained glass, and designed and fabricated some windows myself, years ago. When the husband and I started talking about themes, we agreed that we didn't want to do an ocean- or boat- or seashore- based design-- too many of those around already. Then HEcame up with the idea of creating a design based on one of my knitwear patterns! I wanted to end up with a window that would become an abstraction of the original, so I decided to use a detail of a stitch pattern or patterns, not a photo of an entire garment, as the basis for the design. Above is the photo I brought to Andy at Glass Hut in Falmouth, MA, last spring. 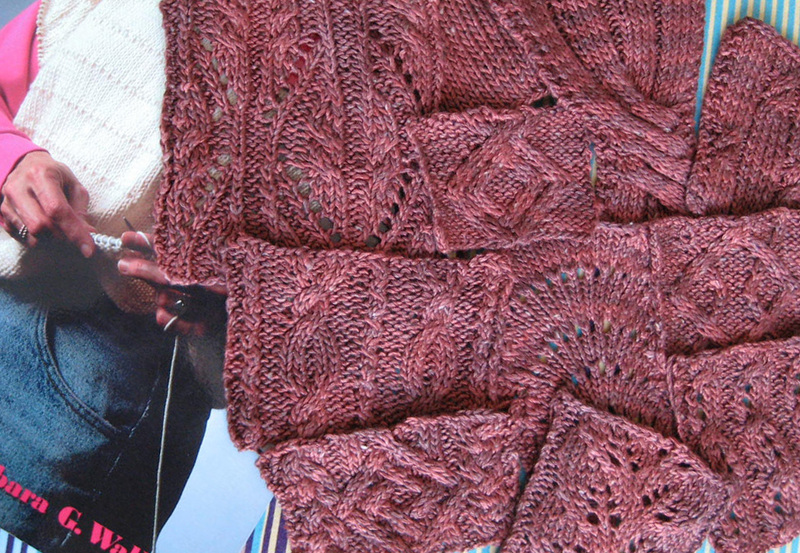 It's a detail of the back of the #30 Aran Wrap cardigan (top photo), published in Vogue Knitting Fall 2008. Over the next couple of weeks, Andy made a pattern for the window, and then we chose the glass, and then he started cutting and fitting and soldering, and finally...last week the finished window was installed. Isn't it gorgeous? And isn't it nice that the husband wants this reminder of me and my work where he can see it from his desk?? One disadvantage of having spent most of the last three years abroad is that I rarely have had the chance to get together with other knitwear designers. So when Connie Chang Chinchio mentioned that she was heading to the Northampton/Amherst, MA area to meet up with some other designers, I jumped at the chance to tag along! The timing was perfect: not only was my son's soccer team (which I am helping to coach) off for the weekend, and my husband available to hold down the fort in my absence, but the fall foliage was approaching its peak. (Cape Cod, where we now spend most of our time, is lovely in many ways, but it is definitely lacking in the fall color department). After I checked in, Connie and fellow designers Gudrun Johnston andYsolda Teague came and picked me up, and we all went out for dinner at the Fresh Side Cafe-- a casual, BYOB Asian fusion restaurant in Amherst (my Pad Thai was great.) There was a lot of shoptalk, as you can imagine, but we covered a lot of other topics too, and I had a great time. The next morning, we met at the Black Sheep Deli in Amherst for beakfast, where I got the waitress to take a photo of the four of us. Then we headed to WEBS-- of course I couldn't visit the Pioneer Valley without seeing the LYS version of my favorite online yarn store! It didn't disappoint-- I was so taken with the seemingly endless aisles of yarn that it took me a few moments to notice the Vogue Knitting Fall 2009 issue at the front desk, with a sample of my Vine & Leaf Beret right next to it! Connie then spotted a sample of her Henley Perfected, so we were both happy. Ysolda was also taken by the yarn-- almost literally, as she sank into the aisle as if into quicksand...well, it does kind of look like that in the picture, doesn't it?! In the end, I got away relatively unscathed, purchasing only a couple of skeins of Dream in Color Classy, and one of Madelinetosh Tosh Lace. On my way home, I passed through Belchertown, where I took this photo. I love fall in New England. I was thrilled when Tanis Gray emailed me two months ago, and told me that my Vine and Leaf Beret would be on the cover of the fall Vogue Knitting. I was actually asked by Tanis to submit ideas for hat patterns for this issue, and since my favorite part of creating hat patterns is working out the crown decreases so they flow from the stitch pattern, I immediately went to my stitch dictionaries and searched for patterns that I thought would adapt nicely to decreasing rapidly-- usually for the flat part of a beret, the decreases work out to approximately 7 or 8 stitches decreased in every round (or something equivalent, i.e. twice as many stitches decreased every other round). Once again, one of my Japanese stitch dictionaries provided the inspiration; when I saw the stitch pattern I adapted for the Vine & Leaf Beret, I immediately thought of rapidly decreasing every other rep down to a single stitch, and then following with the other reps. This is another fun knit, and quick! I highly recommend it. 1) The wrap is really a big rectangle with sleeves, and when worn, the ends of the top of the rectangle and the ends of the rectangle drape into folds to form the fronts-- or wrap and overlap across the front of the body. Thus the usual knitted measurements are a bit hard to determine exactly: for instance the "bust" measurement depends on how the wrap is, well, wrapped. The shoulder to hem length is less variable, because the sleeves control the placement of the wrap on the body; however, note that this length does NOT include the fold-over part of the collar. Thus the actual length of the short side of the rectangle, from top of collar to hem, is about 31". The long side of the rectangle-- the top or bottom edge of the wrap-- for the M/L size is about 49". If you look at the photos you can also see that if left open and allowed to drape, the fronts end up being longer than the back (and longer than the 25" shoulder to hem length given, which is probably most accurate for the back). 2) In the original pattern I called for the zigzag rib sections to be worked in K1, p1 rib for 7 sts (WS: (P1, k1) 3 times, p1; RS: (K1, p1) 3 times, k1) for the 1st 5 rows, then inc 1 in each section as directed in the VK pattern, and THEN begin with Row 1 of the zigzag rib charts (continuing all other charts as established). The VK directions have you work the first 5 rows of the zigzag charts on only 7 of 8 sts (??). Okay...but the major problem with their directions is that the zigs and zags will not line up with the cable crosses in the double braided cable DBC) and reversible rib cable (RRC), as I intended (see photos of the back here), if you don't work Row 1 of the zigzag charts with Row 7 of the DBC and RRC charts. Right: [p1, k1] X 3, p2tog. Cont k1, p1 rib as est until bindoff. 3) Sleeve decreases: Under "Dec rnd 2" the term "armhole edge" is introduced: "Work 3 sts tog at armhole edge." I find this confusing, because by now you are a number of rnds down the sleeve and away from the armhole edge. Anyway, here I would have said, "Work to 3 sts at center of moss st panel at center underside of sleeve and work these 3 sts tog-- 2 sts dec'd." Under "Dec rnd 4" I would have said, "Work to 3 sts at center underside of sleeve and work SK2P over these 3 (not 13!) sts. 4) Edited 8/12/08 to add: Row 21 of the double-braided cable chart should be the same as row 19, and Row 23 should be the same as Row 13. I've had several questions on this topic, so I've decided to list a number of yarn substitutions for the Trendsetter Journey yarn which was used for my Aran Wrap in Vogue Knitting Fall 2008. This is a lovely, 100% alpaca yarn in beautiful heathered colors, but it does have the disadvantage of being quite heavy. I'm not talking about heavy as in yarn thickness, i.e. heavy worsted (which this yarn is, at a ball band gauge of 16 sts to 4"), but heavy as in just plain heavy, at only 55 yards to 50 grams. The construction and fit of the Aran Wrap means that it is really just a large rectangle of knitted fabric with sleeves, and the fronts either fall in folds or are overlapped. While this makes it a cozy layer on an autumn day, it also makes it potentially quite weighty. When I swatched for this design, I actually used a worsted weight wool (Classic Elite Skye Tweed, if anyone is curious), but the VK editors chose to substitute a heavier (in both senses of the word) yarn. Personally, with careful swatching, I think one could go back to a medium worsted weight yarn, meaning a gauge of 17-19 sts to 4"-- but I'm not going to get into making recommendations for that here. So here are some possibilities which have the same (or very nearly so) ball band gauge as the Journey. I've listed all of their weights per 50 grams to make them easy to compare, but if they are supplied in different sized skeins, the actual skein yardage and weight is also noted. Adrienne Vittadini Trina, a merino wool/ microfiber/cashmere blend, 71 yds/50 gms. I'm currently using this for another project and like it a lot; I've had to frog small sections a couple of times and resurrect some of it once, and it has held up well. Shows stitches very nicely. Valley Yarns Berkshire, 85% wool/15% alpaca, 71 yds/50 gm (141 yds/100 gms). Reynolds Candide, 100% wool, approx 86 yds/50 gm (170 yds/3.5oz). Berroco Peruvia, 100% wool, 87 yds/50 gm (174 yds/100 gm). Cascade Eco Wool, 96 yds/50 gm (478 yds/250 gm). And the lightest heavy worsted of them all: GGH/Rebecca Bel Air, 90% merino wool/10% nylon, at a whopping 143 yds/50 gm! Produced using "new spinning technology!!" If anyone uses this, I'd be very curious to see how it turns out; for a project like this, it certainly sounds good in theory. How sweet it is to have my first pattern published in Vogue Knitting magazine! I'm certainly keeping good company, with my #30 Aran wrap alongside Mary Lynn Patrick's #29 cabled jacket in VK's "English Garden" story. A pause while I say "Aahh," and bask in the moment I've been waiting for since I first learned my design was accepted, more than nine months ago (photo at left courtesy of Soho Publishing). And now, please indulge me as I post a few more photos; the top of my son's head managed to find its way into the last one. With each of my last few projects, the number of swatches I have done has steadily increased (I hope this trend doesn't continue!). I've done multiple swatches for different reasons; for my project for an upcoming issue of Vogue Knitting, it was to find different stitch patterns that played well together, while for Etrusca, it was to find an assortment of yarns in different gauges that could be substituted for the Karabella Empire Silk I used-- and to choose among several stitch patterns. 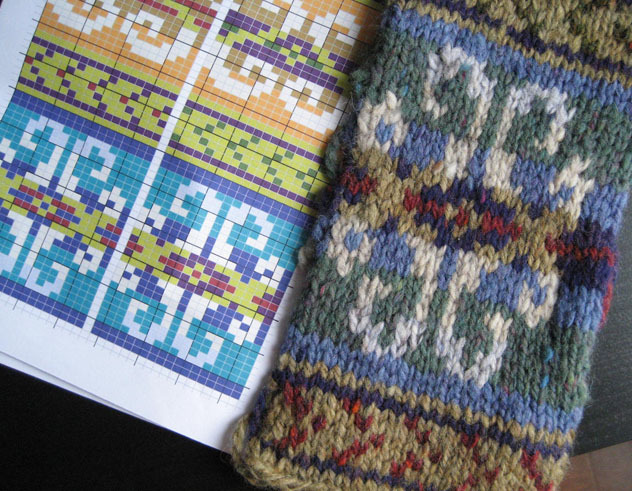 The swatches pictured here are for the next project I hope to turn into a pattern for sale: a top-down* (my first!!) raglan pullover using Tilli Tomas Fil de la Mer, a lovely, lovely yarn. 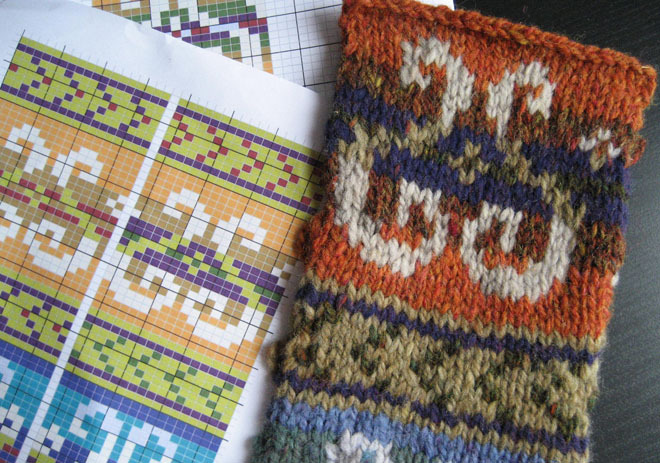 By the way, I'm NOT planning to incorporate all of these stitch patterns into one garment. On a COMPLETELY different topic, I read in some trashy magazine at the gym that various actresses have "girl crushes" on Angelina Jolie, and I thought, "Hmm. To each her own, I guess." Then I wondered who my girl crush would be, and having recently seen A Bridge to Terabithia, Zooey Deschanel came to mind. Then I saw this article about her recent CD release; in the article she is called a "crafty girl" who knits and crochets. OK, found my girl crush. Who's yours?! *Knitting From the Top by Barbara Walker is a great book, but I kinda wish they'd update that cover photo.